Despite never seen a single episode of Ben 10, I’ve become semi-familiar with the show through its many video game adaptations. The last time I saw the tween wonder was in a poorly made kart racer, but now he’s back to beating up a bunch of bad guys. How can a kid who hasn’t gone through puberty beat up a bunch of villains? With a trusty device that lets him take the form of different aliens, of course. 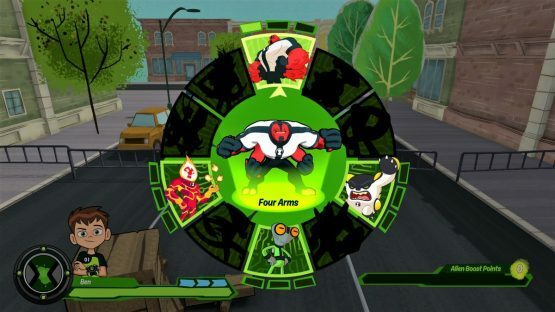 Based upon the cartoon’s recent reboot, the latest Ben 10 game is a pretty standard brawler that has players taking on waves of enemies, destroying every object in sight to unlock in-game energy, and then moving on to the next screen to do more of the same. It’s a very simple game, which makes a lot of sense when you consider that it’s clearly aimed at kids. That said, titles like the LEGO series, which I’ve found to feel monotonous at times, offer up far more variation than here. 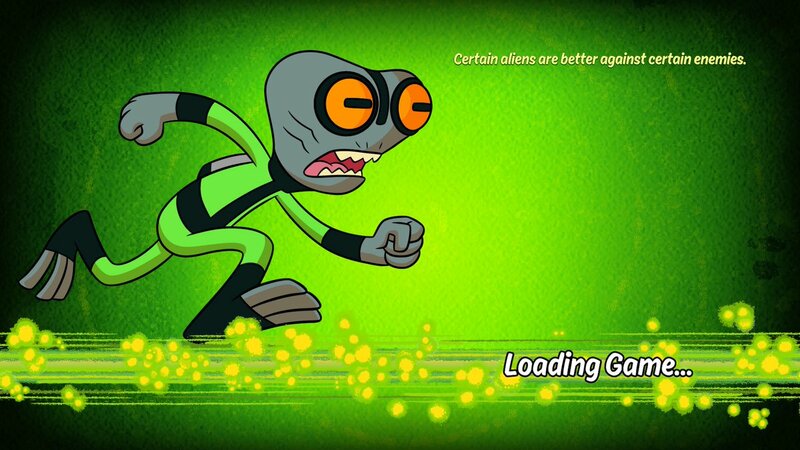 This sense of boredom largely comes from the fact that there are no puzzles to really solve in Ben 10. Occasionally the player will have to switch to a specific alien in order to do a special action, but it’s as simple as mashing the circle button. I never had to put in any thought, which means children likely won’t get stuck, but it also meant that anyone over the age of seven won’t be entertained much. Thankfully, the combat is totally serviceable. It doesn’t feel as satisfying as a God of War, nor does it have the depth of other combat-heavy titles, but each of the different aliens have different fighting styles. It’s not high praise, but it’s at least nice to see some different animations when mashing the square button repeatedly. There are special moves (triggered with circle), and a screen-clearing attack that can be used once a bar is filled, but I rarely found myself having to use them due to the low difficulty. Sadly, the decent combat is paired with rather tiresome combat exchanges. There’s never any fun enemy placement, and every regular fight is simply a dozen enemies thrown at the player. This makes a lot of the game feel like a chore, and in cases where an invisible field wasn’t blocking my progress, I wound up just running by the enemies instead of engaging with them. A good story would’ve went a long way in keeping my attention, but there’s barely in personality to be seen in Ben 10. There are a few cutscenes before boss fights, which players get to see Ben deliver some one-liners, but besides that there’s little context or sense of why the fighting is occurring. I went in knowing very little about the world of Ben 10, and I certainly didn’t learn much here besides the fact that there’s an alien called Four Arms (that unsurprisingly has four arms). The only complex fights are the boss encounters, and these were the battles I had the most fun with. It’s a lot of simple pattern recognition, but it certainly beat mashing the square button repeatedly. Sadly, there’s only three boss encounters in the entire game, so it doesn’t do much to lift the quality of the product. In fact, there’s just not much to Ben 10 in general. There are only six main stages to explore, and while there are some incentives to replay levels (such as finding collectibles and upgrading your aliens with extra energy you pick up), it’s not fun enough to have much replay value. In total, the six stages will only take a few hours to complete (most levels took less than 20 minutes), and I certainly didn’t want to keep playing after the credits had rolled. Besides the HD visuals, Ben 10 feels like a licensed title from a decade ago. Most of the game is comprised of inoffensive mediocrity, and rarely is there anything that feels inspired. Kids will likely have some fun smashing around levels as their favorite characters from the show, but there’s simply too little content for it to keep attention spans occupied for too long. Ben 10 PS4 review code provided by publisher. Version 1.01 reviewed on PlayStation 4 Pro. For more information on scoring, please read our Review Policy here.